Total Stars = 4Entertainment: +1 Stars Education: +1 Star Readability: +1 star Innovation: +1 Stars Inspiration: +0 Stars A conservative that doesn't love war? That's crazy talk. Which is why I loved this book. Much as Milton Friedman laments the theft of the term liberal, Bill Kaufman laments the destruction of true conservative values by Neocons. Apparently the term liberal used to mean that liberals were all about taking other peoples money away, rather than taking it away from the rich to give to the poor as it does now.He makes a lot of great points about how Democrats have started mores wars than conservatives since WWII. As George Washington said we should avoid getting involved in other countries problems. The blood goes just as much on the Democrats as the Republicans. Apparently we forgot that or say that the world has changed too much. Maybe it is too late for us to turn back the clock entirely to the point where we could be isolationists again, but perhaps not running off starting unnecessary wars would be a good start.In a few cases he is willing to over look the flaws (racists) if the people he looks at we against getting in wars. Maybe that is going too far, or maybe we need to let a few things go and look at what we can agree on about where America needs to go. Bill’s points about war and how it is not a pro family institution for our troops and their families was well thought out and presented. The ideas are laid out in a way that may get people on the right to open up their minds. Maybe if they open up their minds they might notice that the values in their religion don't sync up with Neocon policies.Bill has a good, strong voice on what can unite Americans such as thinking small and local versus enormous and global. With thinking like this maybe we can bring the old time conservatives together with the progressives on common ground, rather than looking what divides them.If only the book were thicker with Conservatives against war, maybe we wouldn't be where we are today. Ain't My America is a fascinating and valuable book; it will remain on my shelf. One can often tell when a book held my attention by (if I own it) the frequency of underlining in it. Well, the amount of ink I expended on this book is enormous; there is a word, a sentence or an entire paragraph underlined at least once, usually much more, on every page. Some pages are a mess of smeared ink.I have probably never encountered an author who shows off his extensive vocabulary this much. The late William F. Buckley looks like Beavis in comparison. I'm not sure what to make of this, though. On one hand, if you have an extensive vocabulary, why wouldn't you use it; on the other hand, I know too many jerks already who use archaic words just to show off how smart they think they are.Kauffman is obnoxious in a way much more bvious that that. He's smug, snide and insulting in commenting on the thinkers or politicians he deems militaristic; it makes him come off as self-righteous and self-assured. The passive-aggressive rebelliousness (not anger, notably) is simmering beneath every line. At some point I thought and even wrote in a margin, "What is this jerk's problem?" I know what it is: besides being a pacifist and strong localist, Kauffman has anarchist or anarcho-libertarian sympathies that I can't relate to. One figures that out more from reading about him and observing his book titles than reading what he says in Ain't My America; the book has nothing to do with anarcho-libertarian political ideas. It doesn't necessarily make his viewpoints look good, and worse, makes me more reluctant to read his other books. I am starting to get a broader understanding of what true conservatism is, historically and philosophically, and this book served as one more little nudge away from mainstream neoconservative-influenced politics. Kauffman argues that true conservatism is anti-war, anti-intervention, pro-family, pro-decentralization of power. The conservatives he drags up from American history don't fit the typical mold, but show that things were not always how they are today. As eye-opening as Kauffman's ideas and arguments are, my main problem was that I just could not connect with his writing style. It probably took me twice as long to read this as it should have because of the effort required to digest and follow his sentence structure. Note: My political views have changed a lot since writing this review, but I do still think this is an interesting book with a lot of good points to make, and I wanted to preserve my earlier thoughts. This book, as well as Ron Paul's Revolution, completely redefined my political philosophy. Before both, I thought of myself as a liberal, but upon reading Paul's manifesto and, moreso, Kauffmann's history of anti-war conservative thought, I realized that the values I actually hold are more accurately described by the terms "conservative," "libertarian," and, even better for its hearkening to the Old Right and for its mirroring opposition to the neocons, "paleoconservative". Kauffmann shows that true conservatism holds the position of the founding fathers, to not become involved in foreign wars or alliances, to maintain our Republic as an example. He explores the anti-war and anti-imperialistic thought that has characterized traditional conservatism ever since the War of 1812. Though at times verbose, Ain't My America is delightfully dissenting, well-read and well-informed, and above all eye-opening. It is a staunch rejection of current establishment politics and a lonely cry in the wilderness for a return to the wisdom of the Founding Fathers and Main Street America: a glorification of the small, the local, the humble, the rooted, and the traditional. I can't recommend this book enough. Bill Kauffman is one of my favorite political writers and I have read two of his other books. Ain't My America is written in Kauffman's typically iconoclastic style (and it doesn't have as many swear words as Bye Bye, Miss American Empire). LOL.Sample quote: "Since the nation is always and forever the enemy of the local, the traditional, and the small, the conservative, if she wishes to 'conserve' anything beyond Irving Berlin songs and Betty Grable DVDs, must 'feel' not nationally but locally, on a scale that permits her to know her countrymen not as abstractions but as neighbors. And one does not send neighbors halfway 'round the world to kill and die for 'democracy,' 'human rights,' or 'freedom.'" Good book on classical anti-war politicking. What is important about the book, I think, is that the anti-war position has not just been the cause of hippy peace-niks historically, but rather is tied to an established pedigree in America with a long tradition. Since Washington's farewell address the anti-war isolationist stance was in fact the most respectable opinion in America. That changed with World War I and then more so with World War II. Still, the argument from tradition is an effective argument with educated conservatives who understand history. Kauffman is an ironical writer who is a bit polemical, but entertaining to read sometimes for just that reason. This book is really well written, not many 238-page books can I sit down and read in 6 hours time. The context of the book is also really well done. This work crystallizes a lot of my own thoughts and helped me to realize that what I consider to be wise U.S. foreign policy has a long pedigree going back to some of the founders themselves. 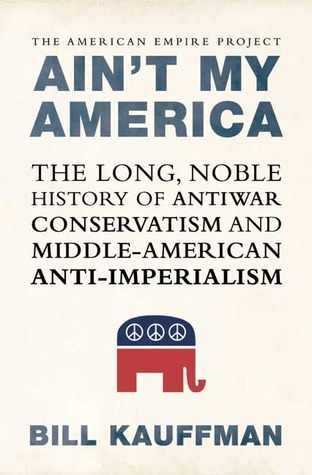 One of the highlights of the book to me was the author's chapter length discussion on why militarism and a neo-con foreign policy is anti-family and anti-conservative. In which Bill Kauffman exalts a parade of New Leftists, John Birchers, white supremacists, mainstream mavericks, and assorted oddballs for their anti-war & anti-imperialist political activities. The end result is enlightening and entertaining from start to finish, but I'm docking one star because Kauffman describes beautiful San Diego, California as -- get this -- a "soulless hellhole". Expertly shows why the two party system leaves many valid points of view out of the national conversation in America. Kauffman shows that conservatives have not always been fundamentalist evangelical war hawks, and that social liberalism can be reconciled with economic conservatism. Great book. I was always skeptical if the warmongering Bush. But I've always thought that republicans support war and increased military spending all the time. From reading this book, i've realized that there was a time when republicans weren't crazy and did not support stupid unecessay wars. A great discussion of how Americans used to know, and some still do, that war does not conserve, it destroys. I gave up after a chapter. This author is so impressed with his vocabulary it makes the book unreadable for those of us with only a masters degree. To be a true conservative has always meant being against the wars of empire. Lots of good history here, with interesting sketches and quotes of people and groups we should not have forgotten. Empire is seductive. If it weren't, this is what American conservatism would look like.